What causes pimples? Pimples, also known as spots or zits, occur when the sebaceous glands located at the base of hair folliclesbecome overactive. The face, back, chest and shoulders are the parts that are mostly prone to pimples. When you get pimples outbreak, it might be a sign of acne. Pimples are not a serious health concern, but severe pimples can cause permanent scaring and low self-esteem. Luckily, there are home medications and remedies that can reduce the occurrence of pimples and scarring. Pimplesare caused by many factors. It can occur when the sebaceous oil glands are stimulated by circulating male hormones at the time of puberty. Sebum is a natural oil-like substance that protects the skin and keeps it supple. Due to the changes in the way that cells matures The increased oil production is associated with the way in which cells mature which may clog the follicular pore. The clog will either appear as a whitehead or a blackhead. The clogged pore eventually enlarges and protrudes like a bump. As it enlarges, it might tear causing irritating materials and skin bacteria to get into deeper layers of the skin bringing about inflammation. If the inflammation occurs in the upper layers of the skin, it produces a pustule; if it is a bit deeper, it forms a pimple; and if it is deeper than the layer that forms a pimple, it forms a cyst. Risk factor is an inseparatable part of "what causes pimples". Despite the fact that the precise cause of pimple has not been established, there are many other factors that might make us prone to pimples. When hormonal changes occur in your body, they can trigger pimples to appear. 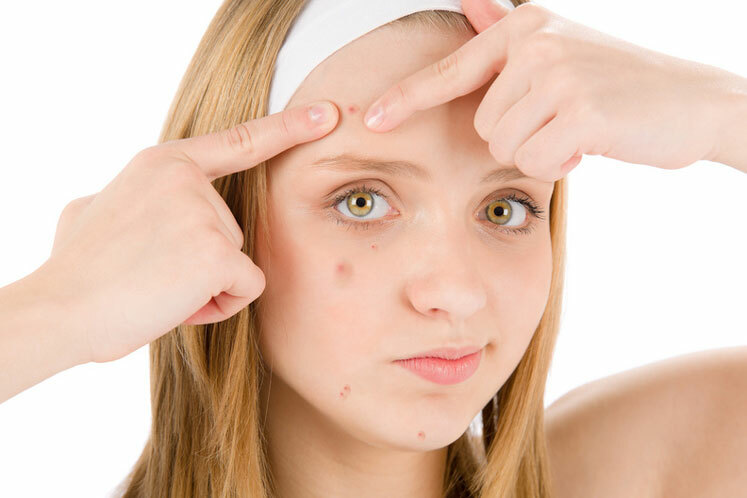 These hormones increase oil production, thus increasing the risk of pimples. Hormonal changes are common in adolescents, women and girls at some point of their menstrual cycle and pregnant women. Steroids found in most prescription drugs are key triggers, whether you ingest or apply them. If taken internally, the irritant will be listed as prednisone, which is a steroid in tablet form. Prednisone is used to treat a variety of inflammatory conditions like allergies and arthritis. If your prescription is for applying, look out for cortisone and hydrocortisone. If you use it for a long time, then you are likely to get steroid pimples. Other ingredients you should beware of are lithium, lithium chloride and some forms of iodine. When taking medication, check if pimple is listed as a side effect. The ingredients causing pimples could be in your beauty products. Acne Cosmetic is pimples or acne caused by make-up, topical creams and lotions. It mostly occurs on the face, hairline, neck and scalp. If you apply products on acne prone areas, you are doing more harm than good. The hair products applied on the hair might rub off on the pillowcase at night and get to your face causing irritation. It is, therefore, advised to change your pillow case daily to avoid build-up. Besides, cleaning make-up brushes weekly also will help avoid pimples. Mobile phones collect all sorts of dirt and germs throughout the day, and for this reason they are a major cause of pimples around your mouth and chin. To avoid this, clean your phone with Clorox or alcohol wipes. Workout gear could be another cause of pimple break out. If, for instance, you are using a communal yoga mat, your face could touch where another person’s feet were or their perspiration dripped. It is advisable to place a clean towel over the mat even if it is your personal mat. You should try and keep your hands away from your face at all times even though you wash your hands often. Touching can cause inflammation, and if you touch one part often, there will be increased oil production. Stress cannot be accused of causing pimples. But if you have pimples already, it will definitely worsen it. Now that you have known what causes pimples, you should also know how it feels like. People tend to believe pimples are bumps – however, the signs and symptoms vary. Therefore, a person with pimples can have any of the following blemishes. Blackheads and whiteheads are collectively known as comedones. They occur when hair follicles become blocked with bacteria, dead skin cells and oil secretions. Blackheads are referred to as blackheads due to their dark appearance when exposed on the skins surface. Whiteheads are slightly raised, coloured skin bumps. Papules: small, tender and red bumps that indicate the hair follicle has inflammation or is infected. Pustules: tender red bumps with tips that have white pus. Nodules: solid, large, painful lumps under the skin surface. Formed as a result of secretion build-up deep within the follicle. Cysts: painful lumps filled with pus under the skin’s surface. They cause scars. Note: Pimple is not a serious health condition, but you can seek medical attention from a dermatologist if it is persistent, or if you want to avoid scarring caused by inflamed cysts. If it affects your social life, you can also ask the dermatologist if there is a way to control the pimple or reduce the scars. Pimples are nothing but inflammation of the skin. Using natural remedies is the best way to reduce or get rid of them completely. But if home remedies fail, you can always turn to medical treatments to solve this problem. When it comes to choosing products for your face, choose those that are labeled ‘water-based’ or ‘noncomedogenic’. Keep away from oily or greasy sunscreens, cosmetics hair products or pimple concealers. For others, pimple is worsened by the sun. When getting medication, check with your doctor if the prescribed medication will make you more susceptible to the sun. If so, then stay away from direct sunlight, and if you have to come into contact, use sunscreen that is not greasy. Ensure you hair is kept clean and off your face. In addition, do not rest your hand or the phone on your face because of the germs they carry. If you sweat a lot, tight clothing and hats should be off limits because sweat, dirt and oil contribute to pimple.If you notice you are developing pimple around your hairline, shampoo your hair more often. Besides, products like facial scrubs, masks and astringents are not recommended and washing and scrubbing your face excessively are also a bad idea because they irritate the skin, which in turn will worsen pimples. Stop squeezing your pimples for it may cause scarring to occur, and also let in infections. If you need those pimples to vanish quickly, just seek a dermatologist. If home treatment does not stop the pimples, then you might need to use medical treatment. The following are some medications can be of great help. They are great for treatment of mild pimple. They are mild and their active ingredients are benzoyl peroxide, sulfur, resorcinol and salicylic acid. Side effects: skin irritation, dryness and flaking. They work by killing unnecessary skin bacteria, promote cell turnover and prevent plugging in the follicles. Their main ingredient is benzoyl peroxide. Side effects: burning, stinging, peeling and even redness. They are recommended for moderate to server pimples and should be taken in a short while. They reduce inflammation and bacteria. They are mostly coupled together with topical benzoyl peroxide creams to avoid antibiotic resistance. Side effects: stomach upsets, dizziness, skin discoloration, increased sun sensitivity and reduction of oral contraceptives’ effectiveness. Use of chemical peels and microdermabrasion can be used to control pimples. These procedures are most effective when combined with other forms of treatment. Side effects: short term severe redness, scaling and blisters. In the long run skin discoloration could occur.